or you can just overclock like a muthafuxxor to much the same effect. Eth is very kind power wise. This trick will work if you have not overclocked your GPUs, if you overclock them then they may be working at higher frequencies than the ones set for the P0 power state. This trick did not work for me, furthermore, the power stats reverted back to 2 after restart…. The change is not permanent, you need to reapply it after a restart. Any else get “failed to initialize NVML” when they try to run this? 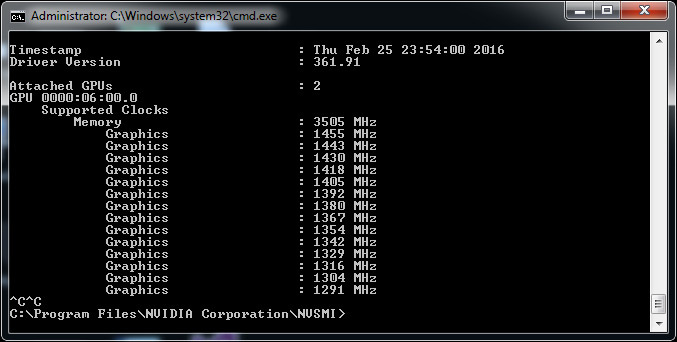 gtx970 SCC evga pulling 19 – 22mh/s in windows 10! 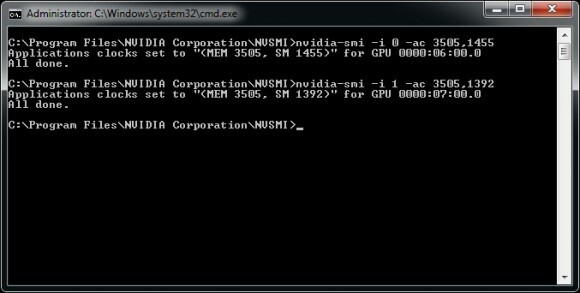 How would you force a nvidia gtx 1070sc into p0 state?The nvidia-smi does not support this card and the card stays in p2 state,anyone help? 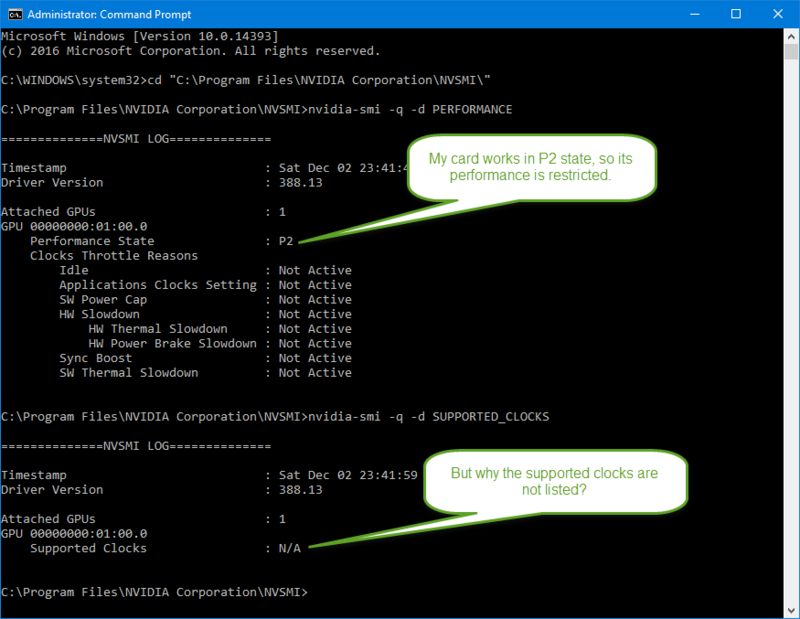 I have Window 10 with GeForce® GTX 1060 and NVIDIA driver version 388.13 I tried “nvidia-smi -q -d SUPPORTED_CLOCKS”, but it show only N/A and does not show the supported clocks, see the screenshot: https://developernote.com/wp-content/uploads/2017/11/nvidia-smi-shows-p2-state.png . What does it mean? I managed to force my Asus GTX 1070 Dual OC cards into performance state p0 usint Nvidia Profile inspector. Just google it and download. Which CuDA version are you using? 9.1 or 6.5? Did you need Visual Studio? If so which version and is there a free workaround? I’m understanding CUDA 8 needs VS15. Thanks, Daniel K. It really worked! The “Optimize for Compute Performance” option is only available on 2nd gen Nvidia Maxwell GPUs like the GTX 980, so if you have one of these you should give it a try and see if it can help improve mining performance. Here is a code for a small program to keep the card at P2. Then you can overclock without worrying the card going to P0 and crash. Search setiathome forums for a download link. 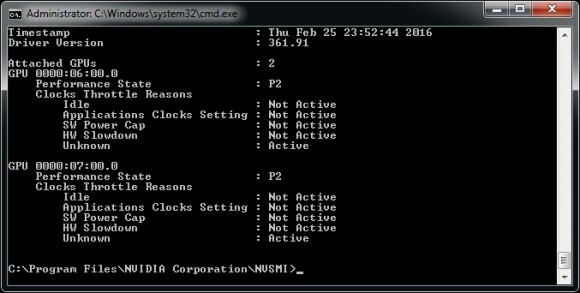 This utility helps overclocked systems not to enter P0 state and crash.